WOW! A stunningly clear, beautiful, calm day combined with unexpectedly stellar snow conditions: smooth windpack, then untracked powder, and no crust or glop. 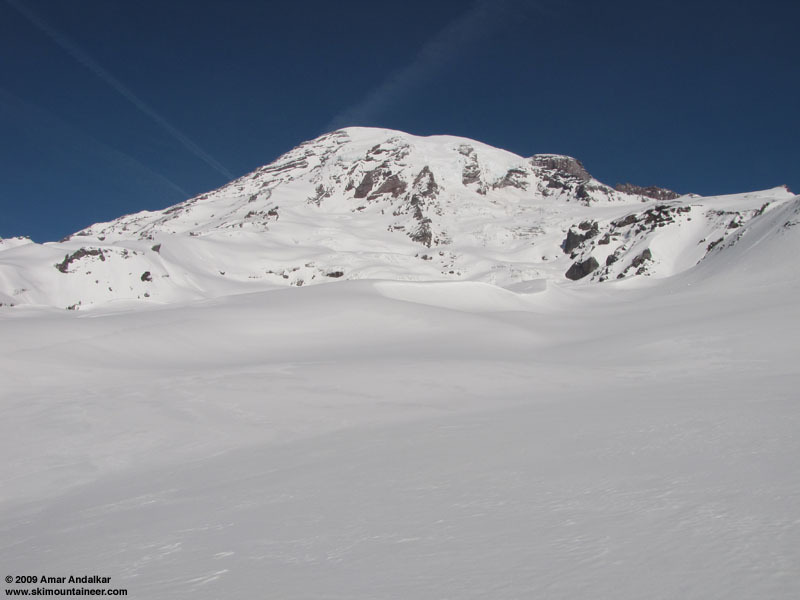 The weather forecast looked great for Wednesday through Friday, sunny with light winds, but the Muir Snowfield seemed an unlikely place to find good snow conditions at this time. The last storm system, a few days ago before the high pressure moved in, had brought several feet of fresh cold powder with freezing levels below 500 ft, but also very high winds topped by a peak gust of 108 mph at Camp Muir on March 7. Seemed like a perfect recipe for producing acres of windblown sastrugi instead of anything nice. 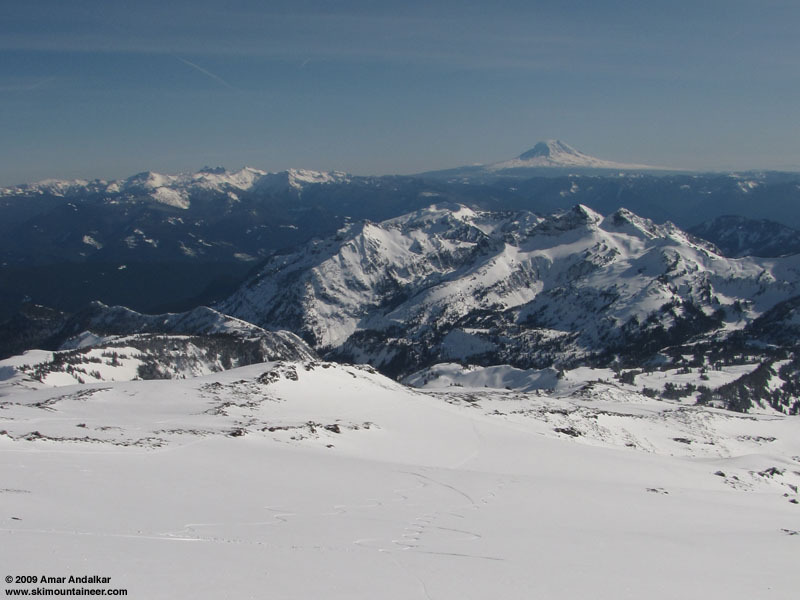 The conventional wisdom would also say that exposed south-facing slopes should be a nasty crusty mess after a few days of March sunshine, while protected north-facing slopes would hold powder. So why go to Muir? . . . well, I just really wanted to. Most people, and most skiers, heeded the conventional wisdom and stayed away. They missed out! A handful of skiers and boarders, a handful of snowshoers, and a handful of climbers (two parties planning to try Gib Ledges the next morning) were the only others on the peaceful and quiet Snowfield. No crowds today, and not even a skin track above Pebble Creek, just a couple of snowshoe tracks. Despite a leisurely start, leaving Paradise at 10:45am, I ended up out in front of the other skiers and breaking a skin trail from 7500 to 9000 ft through several inches of warming powder, which clung to my skins with obnoxious tenacity despite a couple re-applications of skin wax. The snow was colder and firmer higher up, and skinning conditions improved above 9K as the stickiness ended. Warm and sunny at Camp Muir, winds nearly calm with temps hovering around freezing (despite the forecast freezing level of only 2000 ft). I wasn't sure how good the snow would be for the ski down, but thankfully it turned out to be outstanding. Although the uppermost Snowfield above Moon Rocks (9200 ft) did have a fair amount of sastrugi, this was easily avoided by heading far to skier's right where the snow was mostly smooth windpack, nice for big GS turns. Then cut back left to the main expanse of the Snowfield, which held immaculately smooth acres of shin-deep untracked powder, still mostly unharmed by a couple days of sun. Elevation is everything! The best section from Moon Rocks to Pebble Creek (roughly 9200 to 7200 ft) was certainly worth yo-yoing, but it was already mid-afternoon and I wanted to make it to a 7pm slideshow at Feathered Friends, so no second run this time. Below Pebble Creek, the snow got heavier and wetter as expected, but never to the point of becoming a chore to ski. Pan Face, which had been an easy skin up on wintry snow in the morning, was now thick heavy powder but easily carveable. I set off dozens of rollers and pinwheels on the steep face, but saw no major instability such as sluffs or slabs. Even the final cruise from Glacier Vista to the parking lot was in fine shape, with smooth sun-softened snow, no crust, and only the occasional tracks of postholes to avoid. A marvelous day of late-winter early-spring skiing! 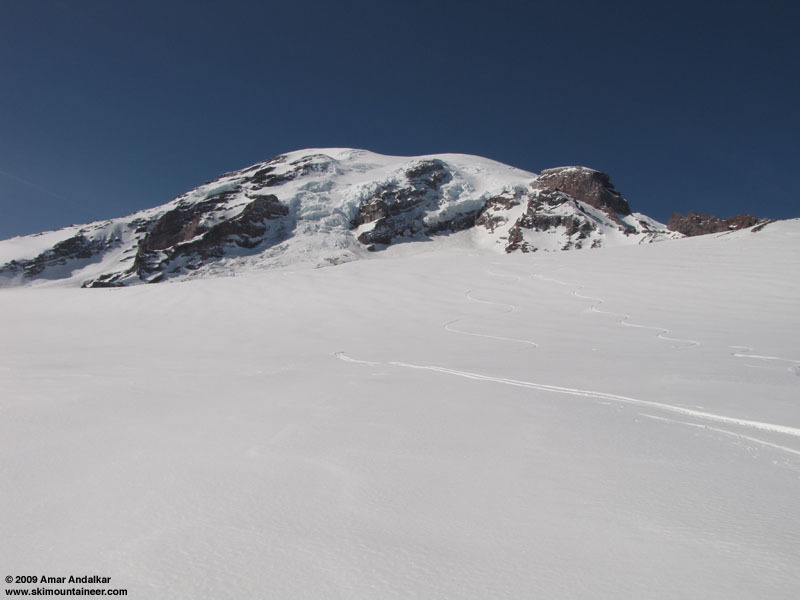 Saw a major serac-fall on Nisqually Ice Cliff just before 2pm, but missed the HUGE serac-fall / avalanche from Nisqually Icefall around 11:30am because I must have been blocked by Pan Point. Posted a photo of the avalanche debris in that thread, along with video of the other serac-fall.